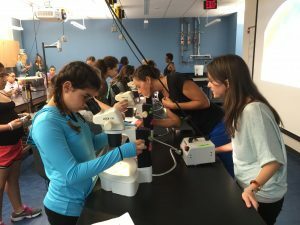 This past Saturday we had the pleasure of participating in the annual Exploring Marine Science Day for 6th-7th grade girls, organized by the University of Miami Rosenstiel School of Marine & Atmospheric Science and the Consortium for Advanced Research on Transport of Hydrocarbon in the Environment (CARTHE). We taught 50 girls from different Miami junior high schools about the effects of oil exposure on developing fish. Both of us were amazed at the enthusiasm and interest the girls showed and very impressed with their insightful and complex questions. We showed the girls videos and pictures of both control and oil exposed fish, and they showed great intuition when we asked them to identify which group had been exposed to oil and to brainstorm some of the traits that appeared different between the groups. We outlined some of the cardiac abnormalities that are the result of crude oil exposure in fish and we got some terrific questions about how that would effect a fish’s ability to catch prey, avoid predation, and whether these effects would be passed on to the next generation. All questions we are currently trying to answer! We were excited to tell the girls that these are questions real scientists are currently trying to answer and if they check back with us on Facebook, Instagram, Twitter, and our website they will see updates to those topics as we work towards the answers. 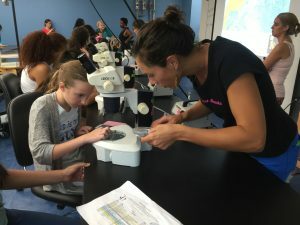 At the end of our presentation all of the girls got the chance to look at different stages of Mahi Mahi embryos and larvae under microscopes, which was a big hit, and a great way to wrap everything up. We were both excited to show these girls that women do really cool science and we loved seeing a group of girls that were so interested and curious; we know that if any of them decide to pursue science they will do great!